The newest Pokemon expansion set, XY Roaring Skies is set to release this week and it looks to be one of the most game breaking sets that we have had in a long time. The set is full of a lot of interesting game mechanics that will add further depth to the card pool and shake up the way that we build decks and play the game. Some of the things that stand out in this set are an emphasis on Colorless and Dragon Pokemon, the introduction of three Delta Traits, bigger benches, and attacks that can be used on the first turn of the game. In this article, I will start by covering the Delta Traits and looking at the Trainers and Special Energy in the set. Later, there will be a companion article looking at the Top 20 Pokemon from the set. Similar to the Alpha and Omega Ancient Traits from Primal Clash, Roaring Skies adds three new traits to the game in the form of Delta traits. These traits are not the same as Abilities, so they’re additional card effects that currently aren’t shutoff by any counter effects, unlike Abilities which can be countered by Garbodor, Wobuffet, and Silent Lab. Plus – If your opponent’s Pokemon is Knocked Out by damage from an attack of this Pokemon, take 1 more Prize Card. This is essentially Lugia EX’s Overflow Ability, just in Ancient Trait form. 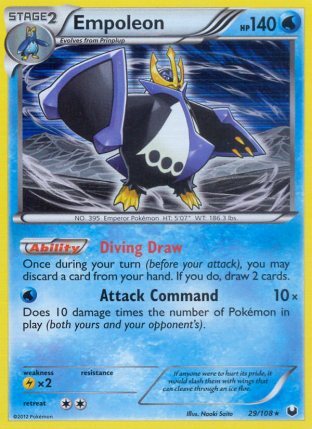 Lugia EX decks have had their times as some of the most dominant decks in past formats, so I would be shocked if decks using Plus don’t do well at some point during these cards’ lifespans. 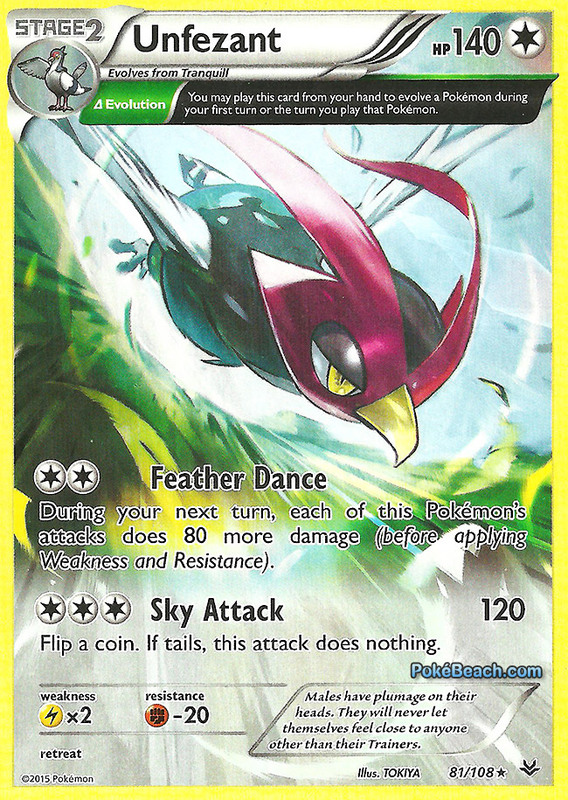 There are five cards that have the Plus Delta Trait – Articuno, Dragonite, Dustox, Swellow, and Natu. Something that is immediately clear is that none of these cards are very easy to use. Most of the cards have a low damage output, so some setup before the KO will have to occur for Dustox, Swellow, and Natu. Dragonite, the one card that does have OHKO potential, is a Stage 2 and has a massive 5 Energy attack cost on its attack that can do damage. It does have an Energy acceleration first attack, but in a format full of OHKO attacks that doesn’t seem like a viable means to power up Dragonite. Articuno takes three Energy to use its attack and it can actually swing for 170 damage with a Silver Bangle, but the attacks damage output is based on coin flips and it is fairly easy to KO while needing quite a bit of Energy to attack. Using Dusknoir to move damage around with Sinister Hand is probably the most straight forward way to setup KO’s for the Pokemon with the low damage output. Evolution – You may play this card from your hand to evolve a Pokemon during your first turn or the turn you play that Pokemon. This trait serves to speed up the evolution process, letting you get to your Stage 1 and Mega Pokemon on the first turn of the game, as well as to get turn two Stage 2 Pokemon without the use of Rare Candy. You can actually even get out Stage 2 Pokemon on the first turn of the game if one of the Pokemon in the line have the Evolution trait when using the new Wally Supporter, which will be discussed later. In total there are five Pokemon with this trait – Altaria, Banette, M Rayquaza EX, Togekiss, and Unfezant. 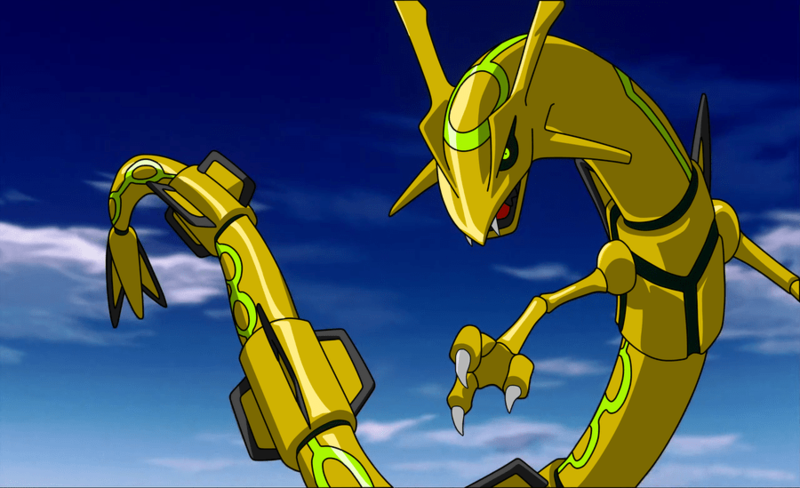 The most eye popping Pokemon with this trait is without a doubt M Rayquaza EX, which can max out at 260 damage on the first turn of the game with the correct combination of cards. That is its max limit, and most players won’t even build their decks to do that much damage, but Evolution should make M Rayquaza EX a reliable turn 1 threat that will be doing significant damage on turn 1 in most games. 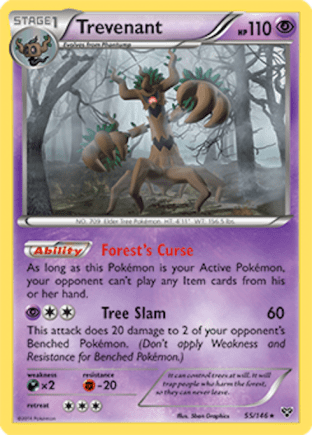 Wild – Any damage done to this Pokemon by attacks from your opponent’s [G], [R], [W], or [L] Pokemon is reduced by 20 (after applying Weakness and Resistance). This trait is so wild that only the M Rayquaza EX, Dragon type, ended up getting it. I’m not sure there is a whole lot to say about the Ability other than it’s always good to be taking less damage, even if Wild only targets a few types. I don’t believe there are currently any Pokemon that resist Grass or Fire, so something with a psuedo-resistance to those two types could matter at some point down the line. On the surface, something as simple as turning Primal Kyogre’s snipe into just 10 damage or Quaking Punch into a 10 damage attack is solid. There are three Supporters in Roaring Skies. None of the three Supporters look like they will be staples in any perceivable format in the near future, but two of them should see niche use. Search your deck for a Supporter Card and a basic Energy card, reveal them, and put them into your hand. Shuffle your deck afterwards. I don’t think this card will ever find itself in a competitive deck. If it does end up in a competitive deck, there will probably have been better card choices that could have taken its place. It’s a very strange Supporter effect to see enter into formats with such powerful draw Supporters. Even the XY-on rotation will leave us with Professor Sycamore, Shauna, Pokemon Fan Club, Battle Reporter, Korrina, Tierno, Professor Birch’s Observations, and Teammates which should be more than enough to form consistency engines with VS Seeker to re-use these cards. Acro Bike, Roller Skates, and strong Pokemon draw support from Shaymin EX will also exist in this format. We would have to wait it out until the rotation after that to see a possible format where it might be playable. If we rotate to Phantom Forces-on, then Professor Sycamore and Shauna will appear to render it useless. If we get a Primal Clash-on format, then Professor Birch’s Observations becomes the best universal draw support, which could make for a radically different format with an emphasis on Pokemon draw support. It kind of irks me that they made this card limiting in the type of Energy it can get. If it could get Special Energy, such as Double Colorless Energy or Double Dragon Energy on the first turn of the game it would have had a few niche places where it was playable. Perhaps they tested it out and found giving decks using those cards such a consistent out to their Special Energy on the first turn of the game was too strong, so they limited it to just Basic Energy. Search your deck for a card that evolves from 1 of your Pokemon (excluding Pokemon-EX) and put it onto that Pokemon. (This counts as evolving that Pokemon). Shuffle your deck afterward. You can use this card during your first turn or on a Pokemon that was put into play this turn. This card is interesting in that it breaks the standard evolution rules of the game, which opens up combinations that would otherwise be impossible. However, its range of effective use is quite limited. The point of the game that it will be truly effective is using the card on the first turn of the game to evolve a Pokmeon for a strong game effect. At any point after that, it will be very limited in use. With a decent setup, you generally won’t need to break the evolution rules to get into a Stage 1 Pokemon after the first turn. So after the first turn, using the card won’t have too great of an impact and in many cases would be equivalent to using Evosoda as your Supporter for turn, and no one plays Evosoda the Item. 1. Is there something to evolve into on the first turn of the game that is game breaking enough to be worth playing an engine that uses Wally? 2. If there is, then is it possible to build a deck that can consistently pull off the turn 1 Wally while maintaining enough room to make itself an effective deck. These questions won’t be easily answered, but I will try to answer them in regards to some concepts that players have mentioned using Wally’s for. I have seen players mention using it to evolve into Stage 1 draw Abilities, such as Slurpuff PHF and Electrode PLF. However, we can already do this with Archie’s Ace in the Hole and Empoleon DEX, which is roughly equal to or better draw support than those two cards. Something that the Empoleon Archie’s combo also has going in its favor is that Archie’s will also draw you five cards, leaving you better off in card advantage than Wally would. Some players have mentioned using it to break Flareon open by allowing it to attack on the first turn of the game. I think if this was something truly game breaking than players would just be building their Flareon decks with Fire Energy to use Energy Evolution into Flareon and then using Colress Machine to setup a turn 1 attack with Flareon. Not to mention that Night March, a similar deck, can already attack on the first turn of the game and for more damage than the average Flareon deck will be able to pull off. Trevenant XY is probably the most interesting turn 1 target for Wally as turn 1 Item lock is very strong, and can shut many deck engines completely out of the game from the get go. However, it takes up a lot of space, and it might not be overly consistent. The amount of space that would have to be devoted to Trevenant might leave you with a deck that doesn’t have much depth and can get knocked down by a mellow breeze if your opponent gets any semblance of a setup. Compare this to Seismitoad EX, which can Item lock on the first turn going second, but who also will have much more room to build a coherent deck around the early game Item lock. And that highlights the biggest turn off of Wally for me, and that is its consistency. How consistent can you make a Wally deck? 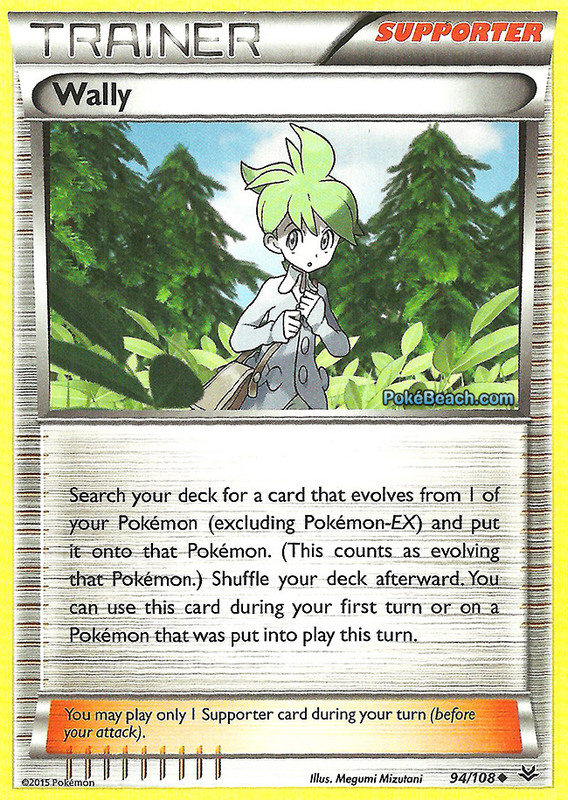 You need to meet two criteria to successfully use Wally’s on the first turn: have one of the Basic that you want to evolve on your field, and then also get Wally in hand. Stage 1’s are generally fragile, so you will probably want a backup attacker, decreasing the probability of getting a Basic of that Pokemon early in the game. After fulfilling that part of the equation, you would also then need Wally in hand (between Battle Compressor/VS Seeker, Shaymin EX, Jirachi EX, and just drawing it), and while there are a lot of outs to getting it, how much space do you want to devote towards that mission? Then, even if you do get the turn 1 Wally, you still will want another form of draw for your next turn as a Stage 1 won’t hold ground by itself for very long. I think one concept that holds some potential is to use it in combination with Pokemon with the Evolution Delta Trait. There are two Pokemon that Wally can allow you to get out on the first turn that you otherwise couldn’t, and those are Unfezant and Togekiss. Unfezant has two attacks, Feather Dance for [C][C] which increases the attack damage from your attacks during your next turn by 80 damage. Then Sky Attack, which for [C][C][C] does 120 damage, but you flip a coin, and if you flip tails it does nothing. That is enough damage to knockout everything except Primal Groudon EX with damage modifiers, but the coin flip makes for a fairly unreliable card. However, here is the Bad Deck Monday deck that can utilize this concept. You play Mew EX with Dimension Valley and attach a Water Energy to Mew EX. You use Wally to get into Unfezant during the first turn of the game. You use disruption such as Head Ringer and Hammers to slow down your opponent. You use Feather Dance with Mew EX on your first turn of the game. You then attach a second Water Energy to Mew EX, play down Kyurem LTR, and use Glaciate for 110 damage to all of your opponent’s Pokemon and hopefully win the game knocking out a trio of Shaymin EX. This probably will never be a legitimate deck, but it is a possibility thanks to Wally. The other is for Togekiss, which has an Ability, Serene Grace, which lets you look at the Top 8 cards of your deck and attach any Energy you find to your Pokemon in any way you like. I’m not sold yet on Togekiss as a viable early game energy acceleration source, but it’s the type of Ability that could potentially break Wally if the right combination of cards are released down the road. Where I think Wally will probably see the most play is a 1-of Supporter in a Stage 1 deck, the type of thing that your deck isn’t reliant on, but a strategy that is available when the situation suits it. For example, if you start Bronzor in a Steel deck, you could use Wally to evolve to Bronzong and use Metal Links to a Dialga EX, attach a Double Colorless Energy, switch into Dialga EX and use Chrono Wind on the first turn of the game. Or if you’re playing a Flareon deck, and your opponent doesn’t get a second Pokemon on their first turn of the game, you could play Wally to evolve to Flareon and attach a DCE and possibly use Vengeance to knock that Pokemon out if it is low enough HP. Obviously, using it as a 1-of would be most effective in decks that play Jirachi EX and the Battle Compressor/VS Seeker combo. The new Banette that removes the effects of all Tool cards in play could be an interesting Wally target for shutting off M Rayquaza EX’s Spirit Link on the first turn of the game. Search your deck for up to 3 [C] Pokemon, reveal them, and put them into your hand. Shuffle your deck afterwards. Winona is basically a Pokemon Collector equivalent for Colorless Pokemon, only a bit better since it can grab evolutions and not just Basic Pokemon. Because of its type restriction it won’t see a lot of play, but it is a strong effect and will surely see some play in Colorless decks. 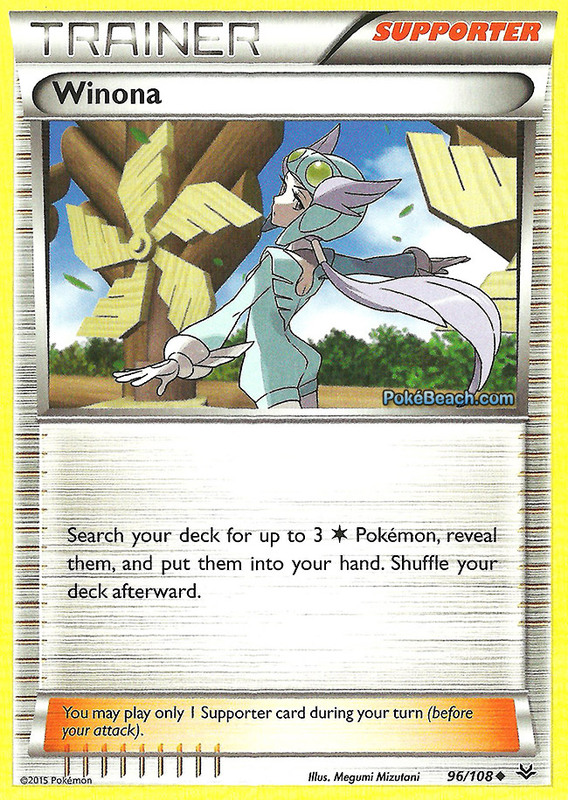 While Pokemon Collector wasn’t seeing a lot of play at the end of its lifespan, Winona is a bit better in decks it can fit in as Shaymin EX is a Colorless Pokemon, so you can grab some Pokemon you want for your main strategy, and then grab a Shaymin EX for some draw. 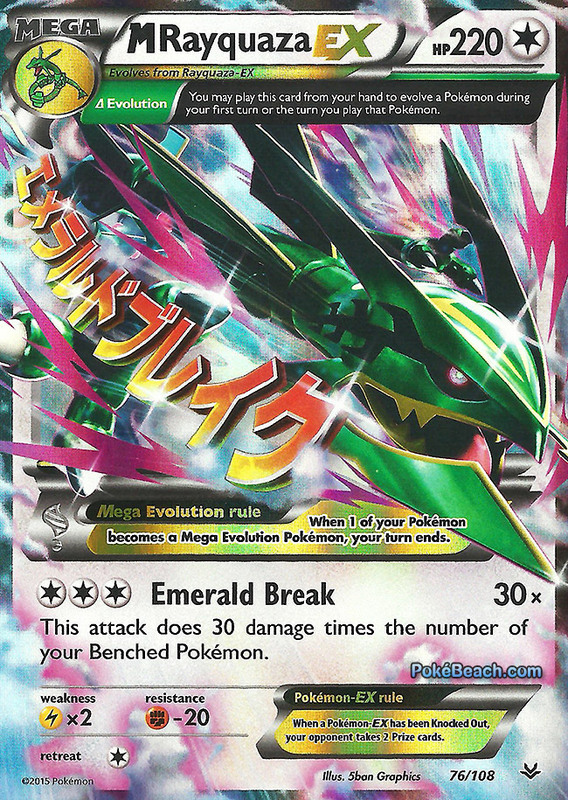 The card was obviously made with the M Rayquaza EX/Shaymin EX archetype in mind. With it, you can get Rayquaza EX, M Rayquaza EX, Shaymin EX, Swablu, and Altaria, all very important cards for the deck’s strategy. There are a lot of combinations of the Pokmeon you can get based on what is already on your field, so there is a lot of versatility in using the card just within that one deck. I think most lists of this deck will likely play at least 1 Winona to be gotten via Battle Compressor into VS Seeker, or through Jirachi EX. I think it also could see some play in Flareon, as it can get you an Eevee as well as two Shaymin EX to start going through your deck. Winona has a limited range of use, but in decks where it is functional it will be very good. Overall there are seven Item cards (that aren’t Pokmeon Tools) in Roaring Skies. Four of these are reprints of cards that are already in format with Ultra Ball and Switch getting regular reprints and Energy Switch and VS Seeker getting gold reprints. These cards are all good and are all staples already, so I don’t think they need further comment. That means that three new Item cards will enter into the format. 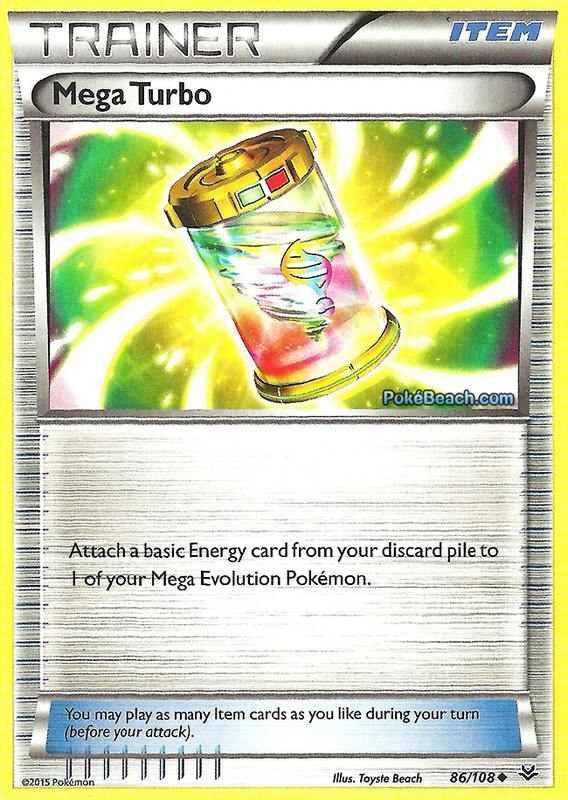 Attach a basic Energy card from your discard pile to 1 of your Mega Evolution Pokemon. Some basic housekeeping to start off discussion of this card. There has been some confusion whether Primal Groudon EX and Primal Kyogre EX can be accelerated to with Mega Turbo and the ruling is that they indeed can be accelerated to with the card. The confusion was caused by these two cards having Primal Reversion text instead of Mega Evolution text. However, as the card says Mega Evolution Pokemon (which they are because it says Mega in the upper left corner) they can be accelerated to with Mega Turbo, however if it had said Mega Evolved Pokemon, it likely would have been ruled that they could not be accelerated to. The closest comparison to this card is Dark Patch, an Item that accelerated to benched Dark Pokemon helping to make Darkrai EX and Yveltal EX some of the most dominant archetypes over the past few years. Mega Turbo is even more insane as it doesn’t have the restriction of only working on bench Pokemon. The card should easily make any Mega with a Spirit Link much more relevant in the upcoming meta game as you can reliably power up all sorts of Megas to attack, many of which can get setup in just one turn. I have a feeling this could be the end of the road for Yveltal EX as an archetype on its own, at least until it receives more support. Yveltal EX decks already struggled with Primal Groudon EX and Primal Kyogre EX decks and those matchups will only get worse when they’re able to power up these Pokemon even quicker. Pair that with more Lightning Pokemon being played to counter Rayquaza and it’s easy to see Yveltal EX not fairing well in the new format. Look at the top 4 cards of your deck. 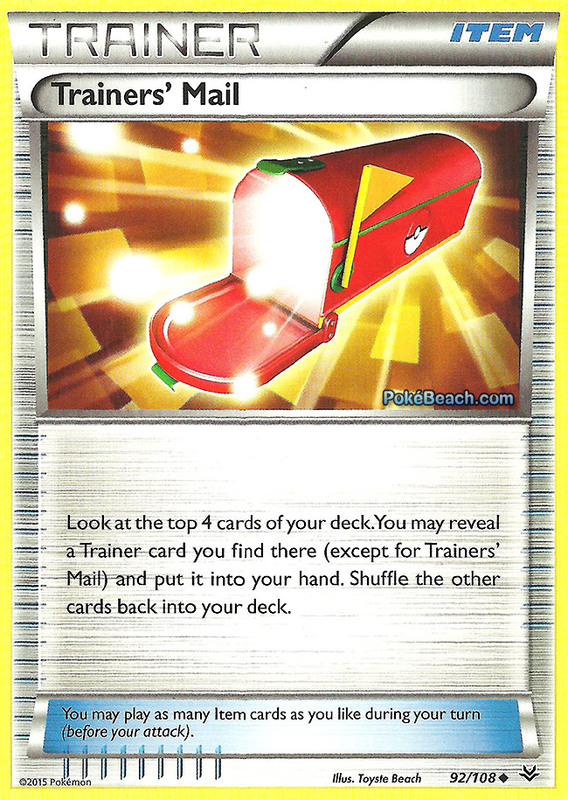 You may reveal a Trainer card you find there (except for Trainer’s Mail) and put it into your hand. Shuffle the other cards back into your deck. This is a card that I have been seeing get a lot of love both online and in my local area. The hype I have been hearing is that the card is excellent for speed decks and really helps their consistency and speed. I, however, have a much more negative opinion on this card. In general, I would think there are four other cards that you can put into your deck that would provide far more positives than looking at the top 4 cards of your deck and taking a Trainer you find there. I think if you’re at the point where you’re putting this card into your deck as a 4-of you haven’t thought critically enough about your deck. Something just doesn’t seem right to me about the hype this card is getting. I fail to see how looking at the top four cards of your deck and taking a Trainer you find there is better than bulking up your VS Seeker line, or thickening your Stadium line, or playing more Pokemon search cards, or playing more Energy cards, or playing that tech Pokemon that could swing a matchup for you. Until a compelling argument is made for why playing this card is better than any of the above you won’t find me slipping this card into any lists. 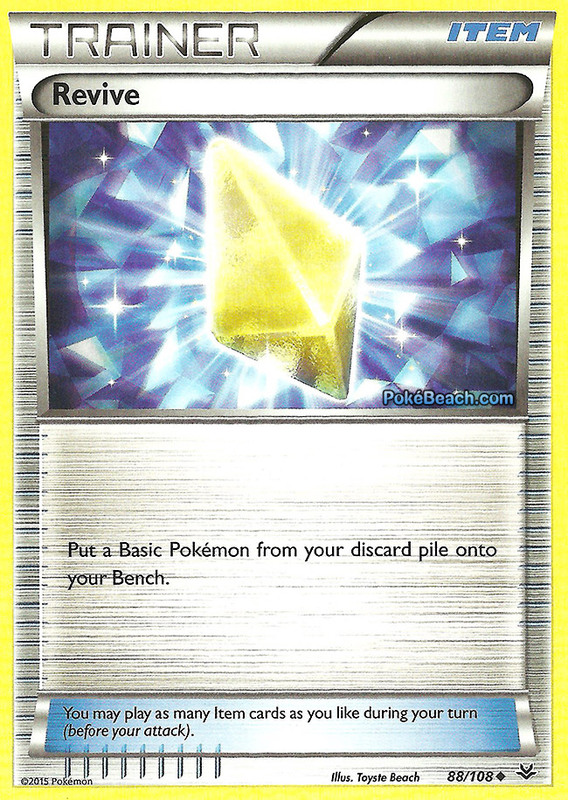 Put a Basic Pokemon from your discard pile onto your Bench. This is a reprint, but it is a card that hasn’t been in the Standard format since Black and White rotated out of Standard, which was the last print of the card. 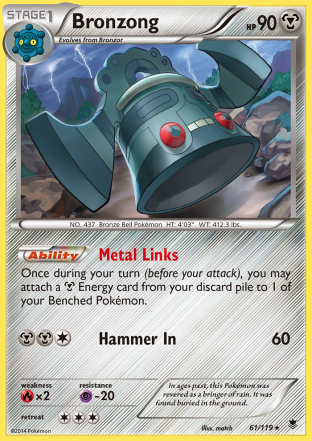 This card almost seems like it should be a staple of nearly all formats like Switch, Ultra Ball, and Energy Switch, but this is actually only the third print of this effect (Base Set being the first), and the Base Set Revive made you place damage counters on your Pokemon until it was at half HP, so this is the first reprint of the exact text. The card typically fits best in a primarily Basic deck, with Durant and Klinklang being some of the decks that made the best use of it in the past. I think Night March is a deck that will really like this card as most Night March lists play almost all Basics and Revive would give them a better recovery option for getting back a Joltik or Pumpkaboo after their last Night Marcher was knocked out. 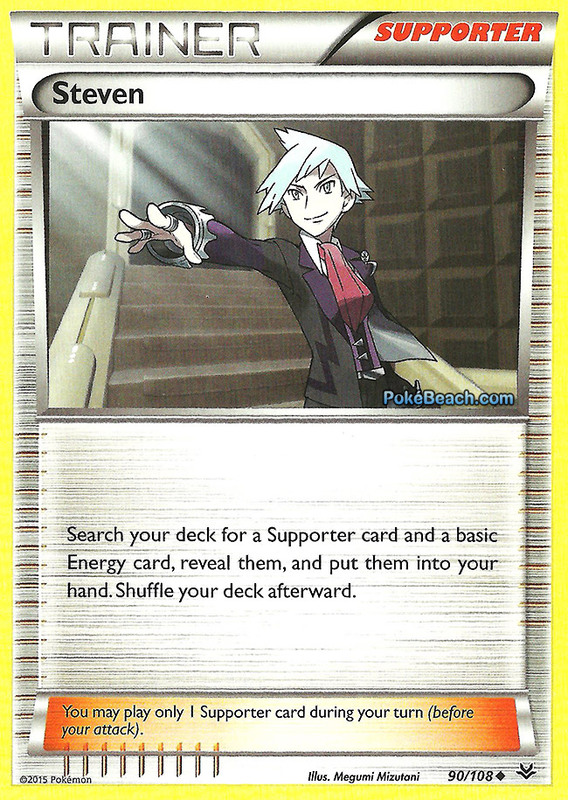 In general, most evolution decks will want more copies of their attackers back, so Sacred Ash and just using Lysandre’s Trump Card are probably better options for most evolution decks. There are five Pokemon Tool cards in Roaring Skies. Three of them are Spirit Link cards for M Gallade, M Latios, and M Rayquaza. They work the same as previous Spirit Link cards and will likely be staples in any decks that are built using those cards. Outside of Spirit Links there are two new Pokemon Tool cards. 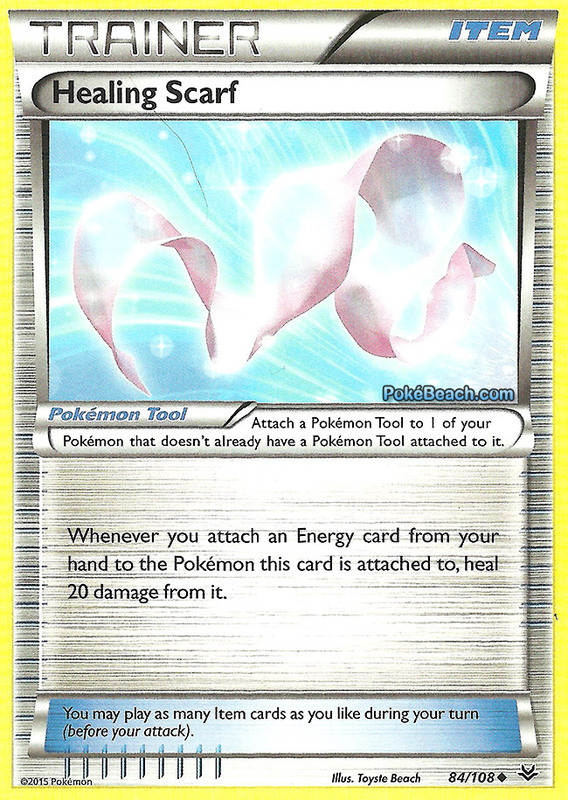 Whenever you attach an Energy card from your hand to the Pokemon this card is attached to, heal 20 damage from it. 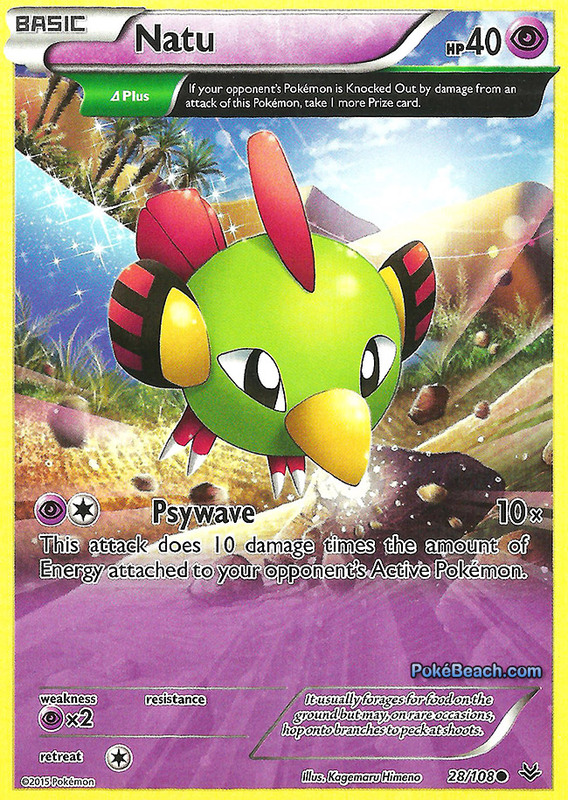 This is actually a card that took me by surprise when I first looked at the scans for Roaring Skies as I didn’t know this was even a card, but it’s a card that I really like. I don’t think it will have a lot of impact when just being paired with manual attachments, but when paired with Energy acceleration the healing can really start to add up. Here are some of the things the card can pair with: Reshiram from the new set will accelerate from hand, so you can heal any time you use Turbo Blaze. Sceptile from Primal Clash accelerates from the hand and also heals 30, so you can actually heal 50 damage for every Grass you accelerate with Sceptile. Pokemon with Growth get an extra Energy attachment per a turn, so you could play something like Primal Kyogre EX and heal 40 with Growth attachments and then heal 30 more damage with Rough Seas for a total of 70 damage healed in a turn. Both Blastoise and Emboar could theoretically heal off an entire Pokemon worht of damage if you had enough Energy to pull it off and wanted to do it. While the card is neat in theory, I’m not sure any of the concepts that can currently use it will want to use it over other options or that it will be good enough to be relevant. 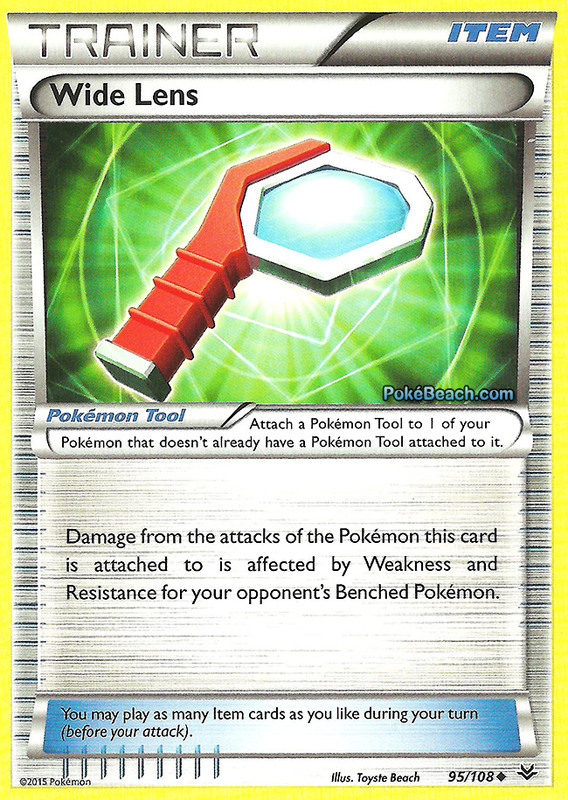 Damage from the attacks of the Pokemon this card is attached to is affected by Weakness and Resistance for your opponent’s Benched Pokemon. This is a very difficult card to analyze, but my advice would be to pick up a few copies of this card and then just wait on them. This is the type of card that won’t generally be good in the game, but as a meta develops the card could end up very impactful in certain decks. The meta will just align to a point where there is a deck that can make good use of it against this against a popular deck or series of decks. The two easiest things to discuss this card with are Landorus EX and Manectric EX. Landorus EX could use this card to knockout both an active Pikachu and a benched Pikachu (or Eevee’s) on the first turn of the game. Manectric EX could use this card to knock out a pair of Zubat on the first turn. The card will be especially interesting with Landorus EX as Fighting decks usually want to play Korrina, and this is the type of card you wouldn’t want to play many copies of, so Landorus decks could play it as a 1-of while still having good access to it. There is only one Stadium Card in Roaring Skies, but it is certainly a good one! Sky Field is one of those cards that will fundamentally change how we play the game and what is possible. Being able to have 8 benched Pokemon opens up so many new strategies, sub strategies and combinations of Pokemon that are viable. 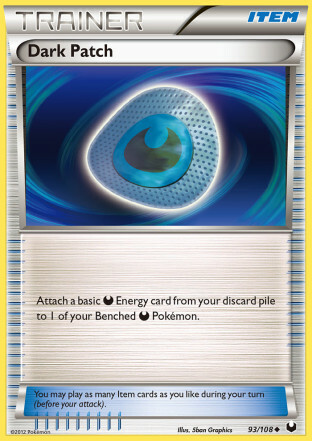 The immediate impact the card has is boosting the effectiveness of cards that do more damage based on the number of Pokemon on the bench or in play. These cards include the new M Rayquaza EX Colorless, Raichu XY, Zoroark LTR, Florges EX, and Shiftry FLF to name a few. All of these cards get instantly better now that they can put more Pokemon into play to boost their damage. What I find more interesting is how you can make use of the extra bench space. 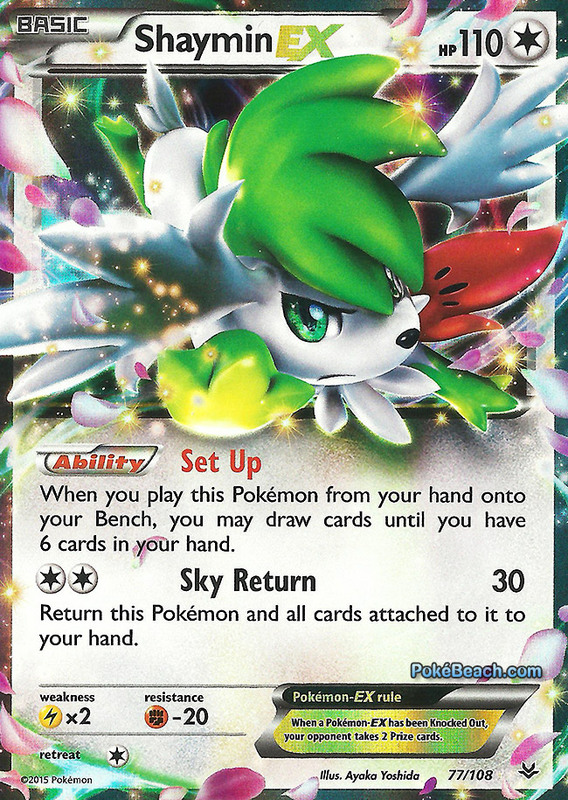 For example a Stage 2 deck could use Sky Field to gain extra bench spots for Shaymin EX to go through their deck and see a lot of setup pieces in one turn to have a strong turn 2. They can then play a different Stadium to discard those Shaymin EX and just leave yourself with a field of Pokemon devoted to your core strategy. The possibilities of what happens when Sky Field gets bounced out of the Stadium slot is fascinating. For example, I was playing a game against M Rayquaza EX/Shaymin EX with my Yveltal EX deck and Sky field was in play. I played down some stuff like mini Yveltal and perhaps some more Yveltal EX and then played Jirachi EX to grab a Supporter. I then played down my Virbank City Gym and was able to instantaneously clear my Jirachi EX from the field. The bouncing of Sky Field could also be used as a healing strategy, especially in decks with Energy acceleration from the discard pile or Energy movement decks. 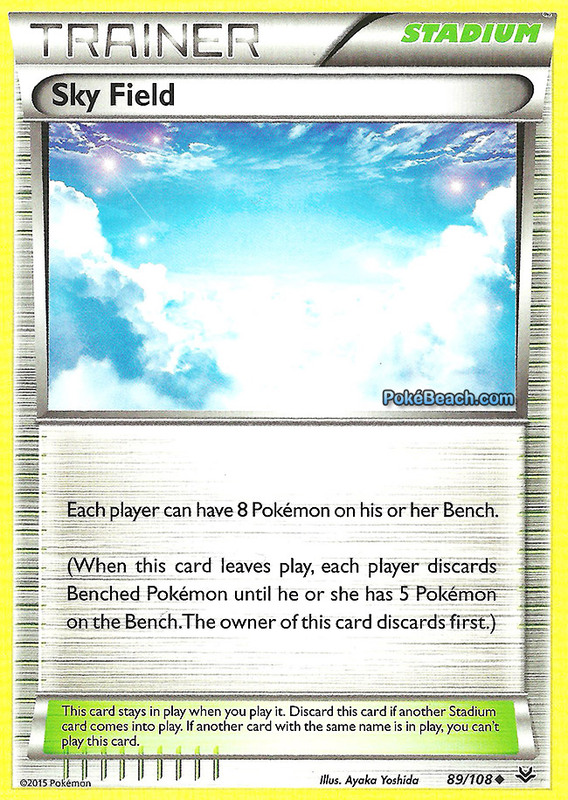 I think being able to successfully utilize the extra bench space, reacting to the use of Skyfield with decks that don’t use it, and reacting to your Skyfield being removed from play when you rely on it will all be fundamentally important concepts that players will need to figure out if they wish to do well in the upcoming formats. 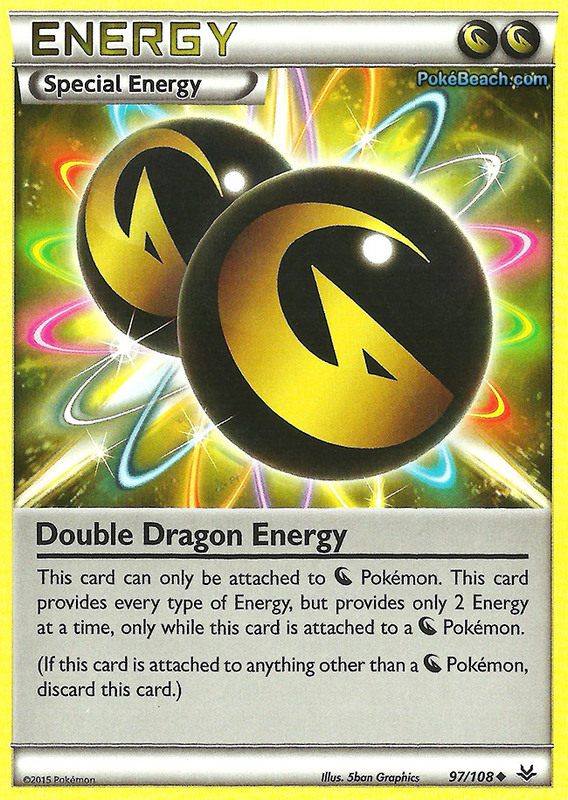 We get just one Special Energy card in Roaring Skies, this one being a Special Energy for Dragon type Pokemon which can only be attached to Dragon types. This card can only be attached to [Y] Pokemon. This card provides every type of Energy, but provides only 2 Energy at a time, only while this card is attached to a [Y] Pokemon. 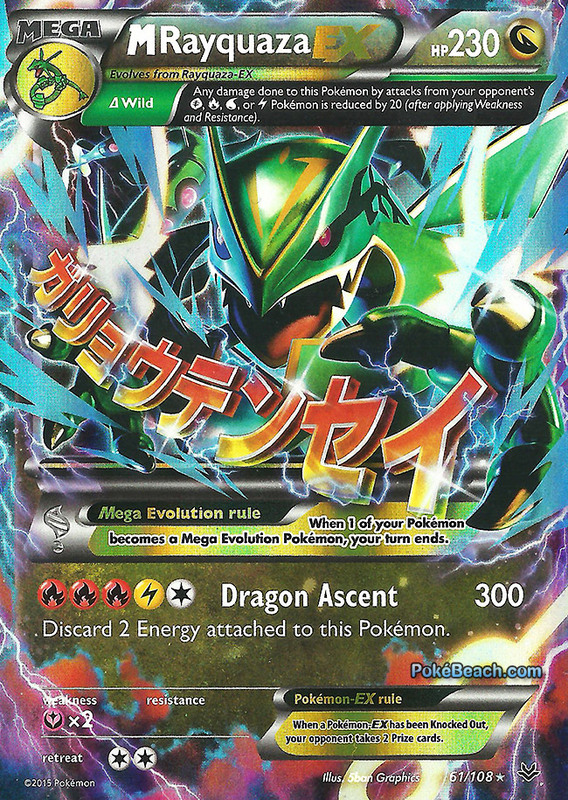 This card is excellent and basically is a Double Rainbow Energy for Dragon types. Dragon Pokemon have always been difficult to play outside of Energy Acceleration decks because of the awkward multiple Energy type costs of their attacks. Double Dragon immediately eases that issue, instantaneously making Dragon Pokemon more viable. Double Dragon Energy will work especially well with the new Reshiram. A lot of the Dragon Pokemon will be able to get powered up in just one turn with a successful Turbo Blaze and attachment of Double Dragon Energy. It’s very exciting to get a last chance to make use of some of the earlier Dragon Pokemon that never saw play because of the awkward Energy costs. my advice when it comes to Trainer and Special Energy cards is always to pick up playsets of every single one of them. They are always fairly cheap when a set first comes out and you never know when something might make sense in a deck. However, if you’re being frugal when buying the set here is the order that I would look to pick up the Trainer cards in. Obviously if one of the lower ranked Trainer cards works especially well in one of the decks you want to play buy those, but in general I think this is the order you would want the new cards discussed in this article in. (I will be leaving out reprints of currently legal cards in this ranking). Roaring Skies is a very strong set when it comes to the Trainer and Special Energy cards in the set. We haven’t even gotten into really looking at the Pokemon cards in the set yet and it’s already clear that just the Trainers and Special Energy cards available in this set would greatly change the format as we know it. The companion article for this one will be looking at the Top 20 Pokemon from Roaring Skies and should be coming out within the next week. Roaring Skies officially will release tomorrow, May 6th. Featured image credit to DemonSheyd500025 on Deviant Art. Roaring Skies scans from Pokebeach.